Ready to pass the Google GAIQ test to earn your Google Analytics certification? I’ve taken and passed the GAIQ exam three times now over the last few years and can help you pass it, too. See my tips below and good luck as you work towards becoming Google Analytics certified! The good news is this: passing the GAIQ certification test is not that hard. As long as you are reasonably well prepared for it! I recently renewed my Google Analytics certification by taking the Google Analytics Individual Qualification (GAIQ) exam via Google Partners. I certified back in the spring of 2014 and it was time to take the test again since the certification requires renewal every 18 months. First a few observations, comparing my 2016 exam with the GAIQ test in early 2014. The 2016 GAIQ test was easier than I expected it to be and took much less time compared to the first one. I passed it this time in ~ 45-50 minutes with a score of 100% (70/70). Minimum passing score is 80% (56/70). Many of the questions came straight off the prep courses offered by the Google’s Analytics Academy. Since I recognized the questions and knew the correct answers, I was able to handle these very quickly… a few seconds each. I didn’t see any questions about Regular Expressions or Tag Manager. Maybe I just got lucky on this iteration of the test. Fair warning… ‘your mileage may vary’ in this regard. I recall I did get a question on RegEx on the 2014 GAIQ. All of the questions I received were multiple choice, but had only one best answer. So I didn’t have to select two, three, or more possible answers in some “correct” combination. This greatly simplified things and reduced the odds of making mistakes or second-guessing things too much if the wording of the question was somewhat vague or tricky. I also reviewed the first two courses offered by the Google Analytics Academy on Digital Analytics Fundamentals and Platform Principles. I had completed these courses previously but decided to dive back in again for a refresher on the details. I retook the quizzes for the individual Google Analytics Academy modules and then the final assessment tests for both courses. Good practice. I also printed out the ‘100% correct’ final assessments for these courses. It was good to have them nearby in case an identical question popped up on the GAIQ exam (which did happen for me, as noted above). These were the two courses I took two years ago prior to the GAIQ, and they still cover the majority of the questions in today’s Google Analytics certification exam. The other Academy courses on mobile app analytics and e-commerce are great too, but they may be considered somewhat optional for taking the GAIQ test. If you have time to complete these courses prior to the GAIQ exam, then definitely consider doing that. They may help you on a couple of exam questions. A basic knowledge of Google Tag Manager *may* also be helpful, but I would say this is still very optional for the current GAIQ. Just prior to taking the exam, I made sure I had the following links bookmarked and ready to open if needed. Turns out I didn’t use them much, but I was glad to have them just a couple of mouse clicks away. I did go into the main Analytics help reference to check on a couple of things during the test, but that was about it. Still seems like a good idea to have these resources handy. If your available GA account views do not have ecommerce tracking set up, you won’t be able to reference these reports while taking the test (see image below). A good option in this case is to just have another *current* reference available that shows the structure of these reports. Something that indicates the typical dimensions and metrics of each report, etc. That’s why I bookmarked the Megalytic resource indicated above. If you want to practice with more example test questions, these resources are also good. Like others have mentioned in earlier posts, it’s very possible to pass the GAIQ certification exam at 80% or better, and well within the 90 minutes allotted, with the right preparation and reference materials handy. It is also possible to over-prepare for the GAIQ test. With decent preparation and maybe a little luck in terms of actual test questions received, you will probably find yourself flying through some of the test and then taking more time on some of the tougher questions. It’s also very helpful to be an active GA user on one or more ‘live’ accounts with real data and real reporting requirements. It may technically be possible to pass the GAIQ test with little actual hands-on time with GA, but the experienced analytics practitioner will definitely have an advantage going into this exam. 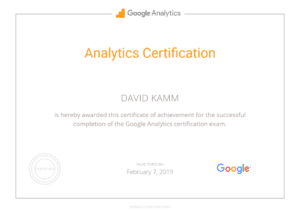 Have you taken the Google Analytics certification exam recently? How did it go for you? Thanks for reading, commenting, and sharing with your social networks below. Disclosure: This section contains affiliate links to related books on Amazon. As an Amazon Affiliate, I may earn a small commission, at no additional cost to you, if you make purchases via these links. I’ve reviewed these books and recommend them for your consideration as helpful resources for Google Analytics users, regardless of how or where you may purchase them. I’ve put together a free Google Analytics Toolkit that will be helpful for many GA users. I also offer an opportunity for free Google Analytics audits that I personally conduct. Click the blue buttons below to learn more about each offer. Need individualized Google Analytics training or consulting support for your organization? See my Google Analytics Consulting Services page. It is good to try maximum questions before appearing for the exam. Thanks, Saran. Good to know that the googleanalyticstest.com resource is still useful. I recall it seemed harder than the real GAIQ too, so it’s a good prep resource. Thanks for adding the other link as well. Thanks for the informational post David and congrats for the perfect 100! I’m planning to take the GAIQ very soon. I have a weird query and I hope you can help me with it. If I take the test and pass with say 80%; can I retake the test to score better like above 90%? Or am I stuck with the 80% for 18 months? Thanks. Hi Reva. I *think* you could retake it to try for a higher score in that case, but I’m not 100% sure. You may also have to wait 7 days to retry, even if you do pass it. I don’t think numeric scores are made public, so as long as you pass it, you’re OK. Good Luck! Okay David. The higher score will be more for personal satisfaction 🙂 Thanks again! It includes a bit about retaking the exam to get a higher score. Looks like you can easily do that if desired, though you won’t get feedback on which specific questions you missed, so you would have to sort of guess on that. Feel free to stop by again after you take it and let me know how it goes for you! Would you mind taking our Google Analytics User Survey? It’s quick and easy, plus you’ll see responses from your GA user peers around the world. Many Thanks!